NEW ORLEANS – After dominating the men’s and women’s championships on their home track, the Oregon coaching staff dominated the National Coach of the Year awards for the 2015 NCAA Division I Outdoor Track & Field, which were announced Wednesday by the U.S. Track & Field and Cross Country Coaches Association. Oregon head coach Robert Johnson was named the men’s and women’s National Coach of the Year and his distance coach Andy Powell won men’s National Assistant Coach of the Year. Southern Illinois throws coach John Smith was voted the women’s National Assistant Coach of the Year. 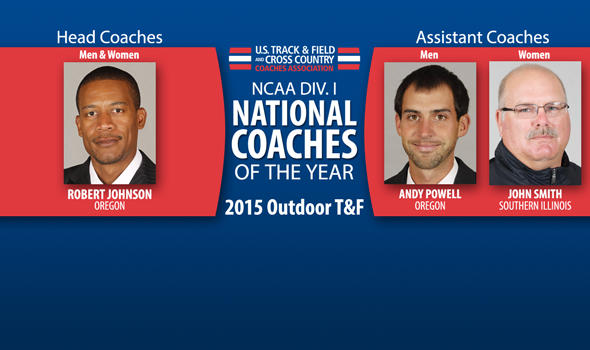 Votes were cast by USTFCCCA member coaches from NCAA Division I programs. Johnson was honored by his peers after his teams won national titles despite spending little or no time ranked No. 1 in the country. The Oregon men won their second straight team title with a whopping eighty-nine points—second most under the current system behind only last year’s Oregon team. The Ducks beat Florida by twenty-nine points, the biggest winning margin in twenty-one years. They’ve now won four straight NCAA indoor track & field titles—sweeping indoors and outdoors in 2014 and 2015. Led by distance runners Edward Cheserek and Eric Jenkins, Oregon’s men defended their national title despite not being ranked No. 1 once in the regular season. This is the first time a team won a championship with zero appearances at the top of the rankings since the computer rankings began in 2008. Oregon’s women weren’t quite as dominant—they only beat Kentucky by nine points. But their title came after a much longer wait. Johnson is only the second coach to deliver a women’s outdoor team title to Oregon, and the first since 1985. The Duck women were led by sprinter Jenna Prandini, who won the 100 and took second in the long jump and 200. Unlike the men, they were ranked No. 1 in the regular season—but just once, and during the final week leading up to the NCAA championships. Those teams pulled off the same sweep at the Pac-12 championships. Oregon’s dual conference championships were particularly impressive considering that the women won without Prandini and the men won with Cheserek and Jenkins competing in one event each. Johnson has loaded up on national coaching awards in recent years. Since becoming associate head women’s coach in 2010-11 and program head in 2012-13, he’s won nine out of twenty possible national coach of the year awards for indoor and outdoor track & field. Johnson has racked up a huge number of wins in a short period. Throws coach John Smith of Southern Illinois is winning his first national honor of a long and distinguished career. Two of his pupils won outdoor national championships in 2015. Shot putter Raven Saunders won her event with an American junior record on her final throw of the meet, and hammer thrower DeAnna Price won that with one of the best marks in NCAA history. Saunders’s and Price’s twenty points netted a twelfth place team finish for the Salukis. Andy Powell won his first outdoor assistant of the year award (after two indoor honors) thanks to huge and occasionally unexpected points from Oregon’s distance runners. Cheserek and Jenkins went 1-2 in the 10000 and 5000, Will Geoghegan was fourth in the 5000, and freshman Blake Haney took third in the 1500. The forty-seven points those four netted would have been a fourth place podium finish as a team; the twenty-three points posted by Cheserek, Jenkins, and Geoghegan in the 5k were the second most in the event in meet history. Johnson just completed his third season as head men’s and women’s track & field and cross country coach at Oregon, and his tenth overall with the Ducks. Powell has been an assistant at Oregon for the same ten years. And Smith has been the throws coach at Southern Illinois for the last eleven years. He also coached at SIU for three years after graduating from there in the 1980s.